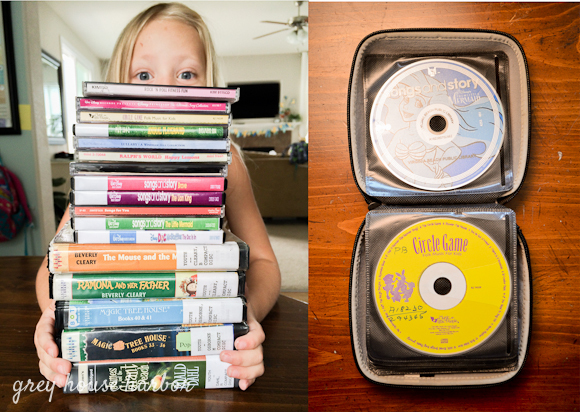 Ok, last installment of my road trip series: kid prep – entertainment! Here are a few ideas on how to keep everyone sane and entertained. 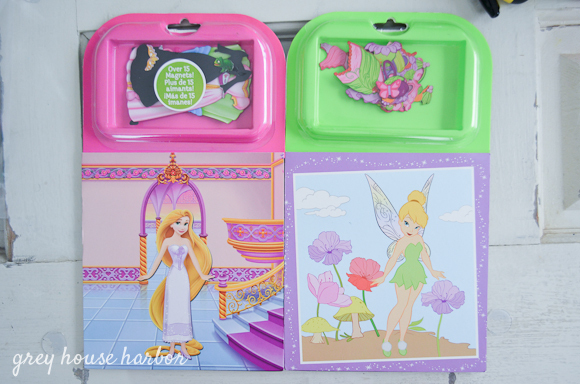 Dollar store, Target dollar bins, and Walmart’s under $5 section are perfect for stockpiling playthings that your kids haven’t seen yet. They don’t have to be expensive, they just have to be new; that’s the key… surprise factor. 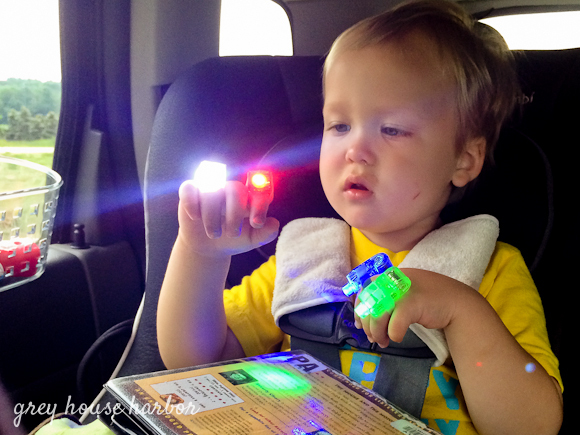 A very popular find were these finger laser lights that I scooped up from Walmart’s cheap toy section. I did splurge on one set of new toys for Songbird. 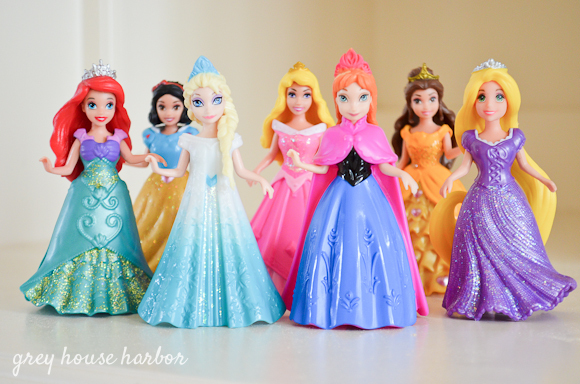 These Disney MagiClip dolls are amazing. Their clothes are super easy to change around and she was content playing pretend with them for nearly half our trip. Handsome gives me a hard time about how I hoard craft supplies, but here’s another example of it paying off. Since their lap trays are metal, I dug out this pack of printable magnet sheets that were left over from an earlier project fail. Now Bug is the new foreman of an entire magnetic construction site! 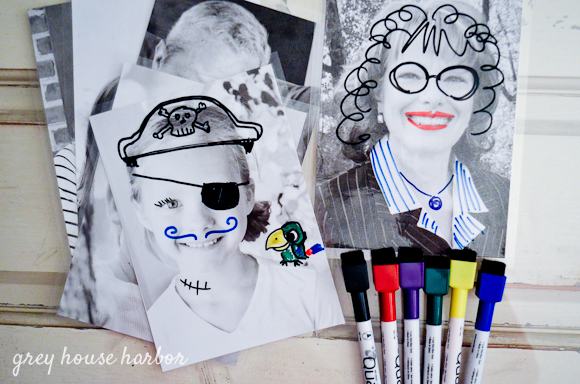 On 5 x 7 pieces of cardstock, I printed family member faces and then used self-adhesive sheets to laminate them for doodling. 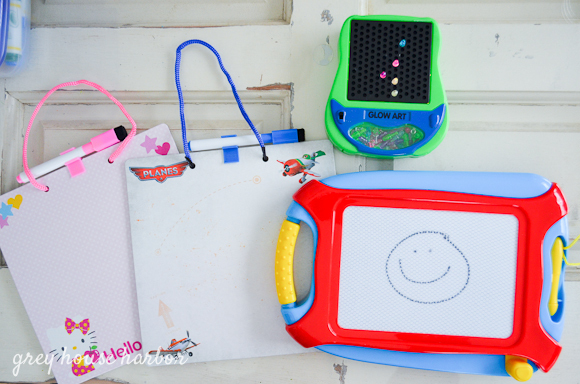 This 6-pack of colorful dry erase markers are perfect for kids because they’re small and have magnetic/eraser-topped caps too. 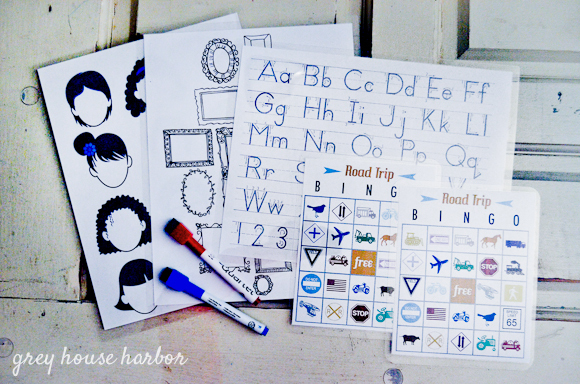 An online search led me to these fun activity sheets, which I also laminated for dry erase use. (faces, frames, alphabet trace). The original road trip BINGO sheets were found here, but people seem to forget that you can’t just print out multiples of the same sheet otherwise everyone may yell bingo at the same time. So I took the liberty of changing a few of the icons around to have 2 boards with different layouts, which you can print by clicking here. All my games, toys, sheets and markers got sorted into labeled gallon Ziplock bags for storage. I purposefully did not pack crayons, as they can melt if left in a hot parked car. 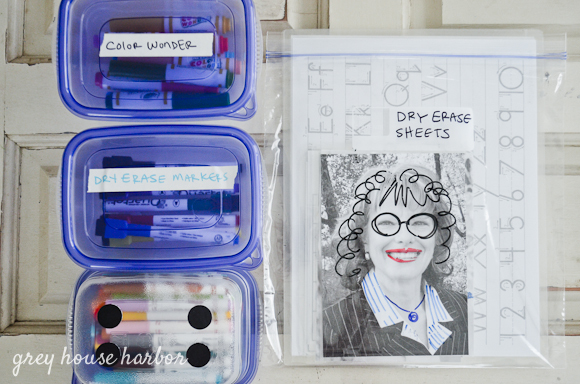 For Bug, I packed mini Crayola Color Wonders to avoid accidental (or intentional) marker graffiti. Songbird can handle big kid markers and I love the small size of washable Crayola Pip-Squeaks. 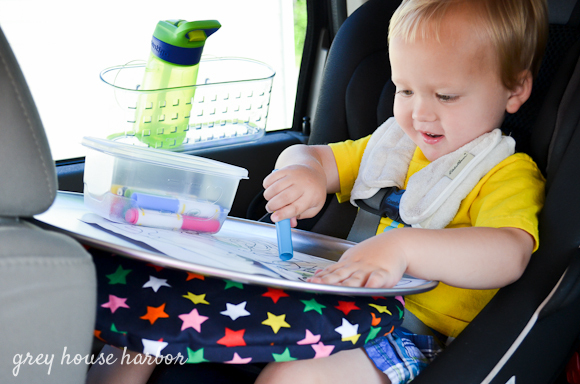 All the markers were put into labeled Tupperware with magnetic buttons on the bottom so they would stick to the lap trays. 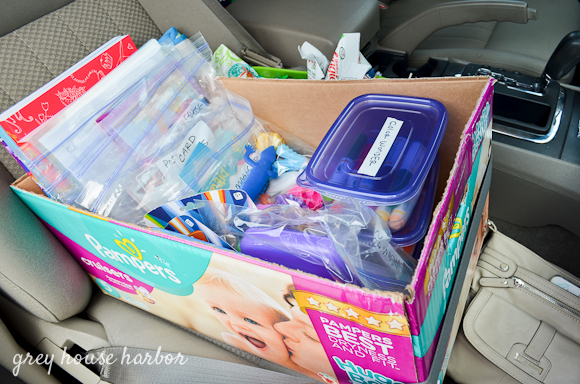 A large diaper box in the front seat is perfect for storing the toys, games, and coloring supplies within reach. To minimize toy chaos, I would allow them one activity at a time. They could trade it out at any time, but this kept pieces from being lost. Since the diaper box has handles, it was a cinch to grab and carry into our hotel room once we arrived at our destination. Let’s keep it real… my kids wouldn’t be entertained by toys and music alone. A couple movies and a few tv shows got loaded onto the iPad and I brought along a USB car charger to keep it juiced up. We had a nice little rotation going – new toy (30 min), coloring while listening to a book on tape (30 min), movie/show with a snack (40-60 min), repeat. 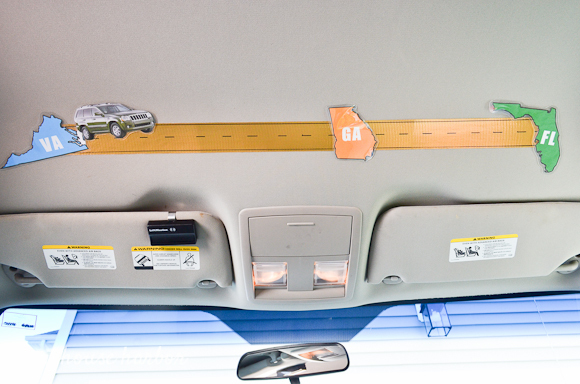 In an effort to thwart that inevitable question, I used gold duck tape and laminated destinations to create a visual road map on the ceiling above my visors. We stopped for 24 hours in Atlanta, hence the three states. 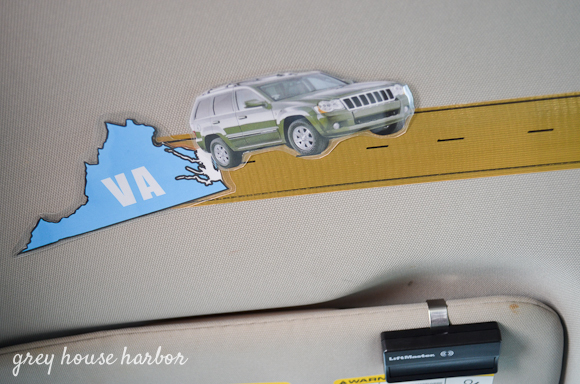 I even printed out an accurate version of our Jeep that got moved every few hours accordingly. All in all, I can honestly say that all my late night road trip prepping totally paid off. 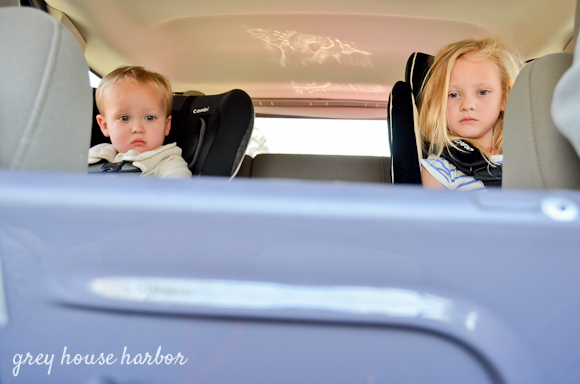 If you missed the first posts about car cleaning and kid organization check ’em out. My little ones were extremely well behaved considering the grand total of 17 hours (one way) that they spent buckled in. Let’s just hope all these same tactics get us home this week! Am about to leave on 56 hours (one way) with two under four. Totally doing the gold duct tape. I love many of your ideas. We are doing a 3,500 mile road trip this summer with 6 kids. AHHH I know. Could you share were you got some of your printables with links I want to totally do a picture of our JUMBO van and the road. I think my 4 younger kids will love it. Thanks Melissa. That sounds like an epic road trip with quite the crew!!! There are links in the post to all of the activity printables, just click the blue words. For the car I searched google images for my make/model and the states I created in Photoshop. But Etsy is a great place to buy clip art if you can’t make them yourself – search “state clipart.” Praying an extra heaping of grace for your adventure! I love the Car with the gold duct tape idea! But I have to ask- did it do any damage the upholstery to your car? Awesome idea! How big did you make the states? Thanks Jeanette. I made them about 5 inches wide or so. How did you attached the car, duct tape also? Yup! Just a little rolled up on the back. Such great ideas! Where did you find such fun and simple state shapes? I also would like to know where you found the simple state shapes. I have made a visual for my kids like that before with an accurate print out of our van traveling on a piece of yarn across the van. But I love the idea of adding the states to it!! Where did you get the lap trays!! 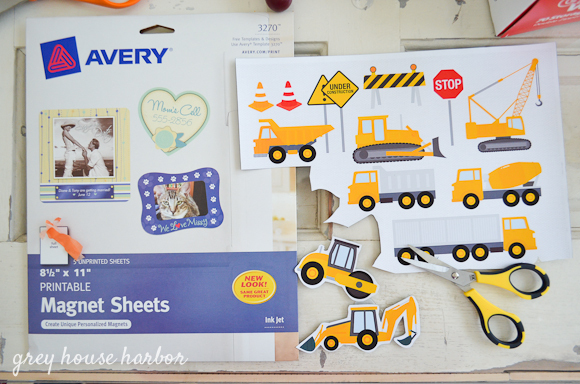 I’m so excited to use these ideas for my little one! 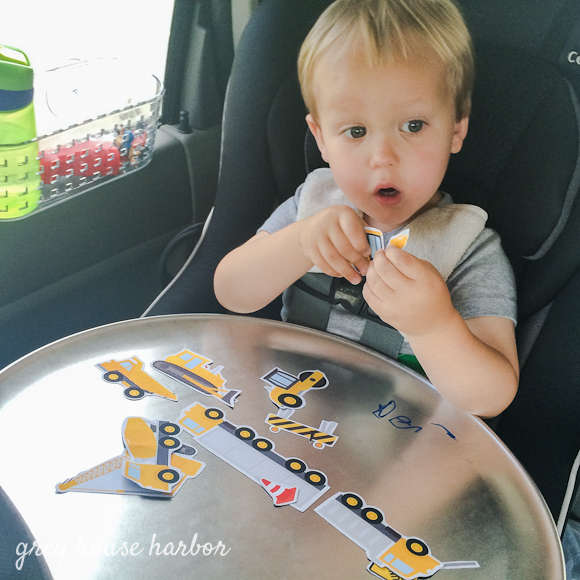 The construction vehicle magnet. Where did you find the images for that project?